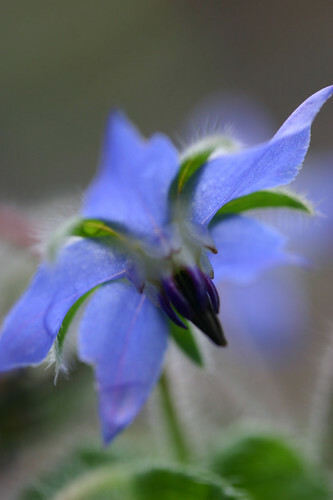 Flowers occupy an uneasy space in many vegetable and herb gardens. Sure, we grow them for their good looks and scent, to relieve the eye from all that green. Mostly, though, we’re trying either to forestall the flowering event in vegetables and herbs—if what we harvest from a plant is leaf or stem rather than fruit or seed–or to usher the plant safely through the flowering stage and on to the point—the fruit. But what about eating and drinking the blossoms themselves? Or the seeds? Sunflowers and popcorn we grow for seeds, sure. Artichokes, cauliflower and broccoli we plant for the buds. The French, we know, do spectacular things with candied flowers and blossom-based liqueurs, the Benedictine monks, for instance, and their Chartreuse made from some 130 herbs and flowers. History tells us of flowers used medicinally and strewn about the floor and folded into clothes to mask less desirable scents. Some of us might have vague recollections of great grandmothers making elderberry flower cordial or dabbing rosewater behind an ear or lining a drawer with lavender flowers. And for dinner, we might well toss a few Johnny jump-ups or nasturtium blossoms into a salad or around a plate for a splash of color. But our gardens are filled with missed flower-eating opportunities. Take lavender. 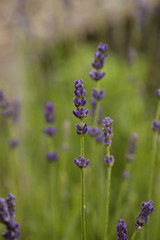 I grow it in abundance not only for its lovely purpleness, its deep Mediterranean scent but for syrup, ice cream, jelly and flavored sugar and salt. Nasturtium blossoms for vinegar and their seed pods as a substitute for capers. Calendula petals to add a spicy, saffrony flavor to dishes. 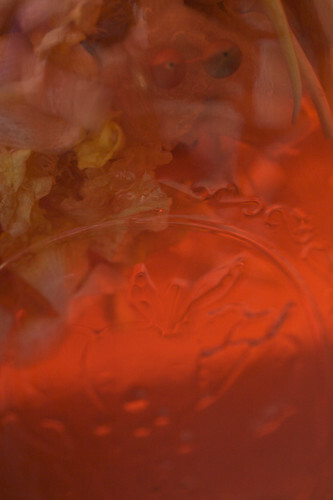 Fragrant rose flowers for rose-petal jelly; their hips for tea and rose-hip jelly. Chamomile blossoms for tea. Cilantro flowers for a milder taste than the leaves; their seeds, which magically metamorphose into coriander. The same goes for dill and fennel—I use leaf, flower and seed in my cooking. 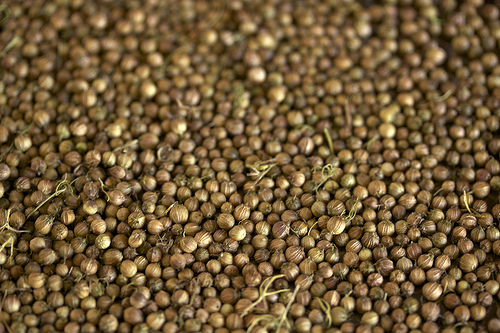 I pick the seedheads of certain mustard and poppy varieties to dry. And best of all, perhaps, are fresh squash blossoms I gather and stuff. Yes, squash. 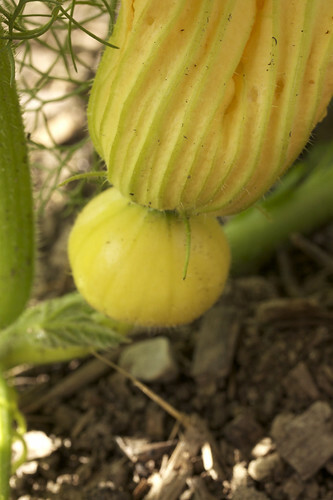 Who needs more than a single zucchini plant if you’re growing them for the fruit? How many of us have had to contend with giant squash bats as we struggle to keep up with this prolific provider? People think I’m mad when they see my nine robust Lebanese summer squash plants (a close relative of the Italian sort) covered with flowers. I am mad. Mad about squash blossoms. Most of the male ones (those that grow on long slender stems rather than at the end of the swelling fruit) and some of the female will end up in the sauté pan stuffed with seasoned ricotta or atop a pizza. I call it stingy gardening, getting everything possible out of a plant, while leaving enough for the rest of the garden residents. 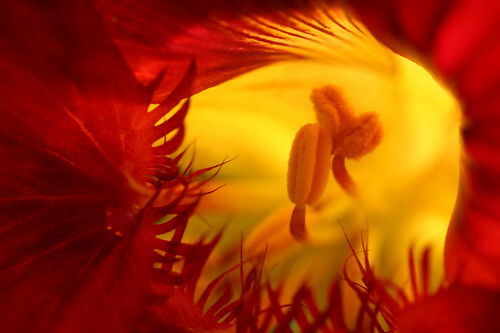 Not all flowers are edible, however, and some should be eaten in small amounts, so be sure to check a reliable authority on the subject, such as the website, What’s Cooking America: http://whatscookingamerica.net/EdibleFlowers/EdibleFlowersMain.htm (this site also has many excellent flower recipes). And always check flowers for wildlife. I’ve learned this the hard way, repeatedly. A couple of nights ago my husband asked if I needed help making dinner— pasta with arugula, Thai chile peppers, fresh figs, and squash blossoms stuffed with goat cheese. I pointed to the pile of just-picked blossoms on the counter. “One of those flowers is buzzing. I think a bee is stuck inside. It would be great if you could help it out.” Holding it as far from himself as his arm would stretch, he took the humming, tightly closed blossom outside, and sure enough, when he opened it, a bee flew out. But it kept humming. Another bee flew out. Then another, and finally a fourth. A regular party going on inside one small blossom. Glad I didn’t bite into that one in the garden, something I’m known to do–especially when I’m taking a non-gardener/non-cook for a tour. It reminds me of the summer I was thirteen and discovered my mother’s copy of the 1960s classic, Euell Gibbon’s Stalking the Wild Asparagus. I decided to contribute to the table by foraging for the abundant wild foods around our seaside Maine cottage. We already picked berries from field and forest, so I set about harvesting the offerings that grew along the sea’s edge, namely beach peas and wild rosehips. Well, that lasted exactly one picking. The only pot of beach-pea pods I ever steamed sprouted a sea of worms that floated to the top as they cooked. The rose hips had thrips boring holes into their hearts. From then on I decided to leave such delicacies for the wildlife. But in my own gardens I’m deep into flower harvest. 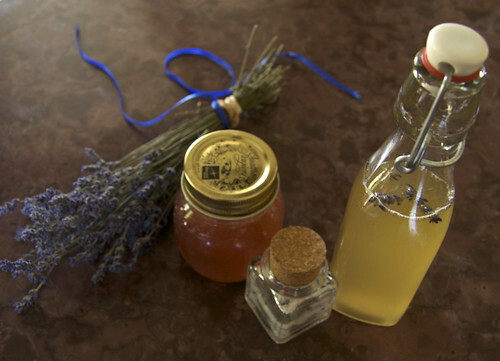 We’ve eaten squash blossoms for weeks now, sipped chamomile tea and enjoyed lavender-rosemary syrup on blueberries. I’ve made delicate lavender jelly and just filled a half-gallon canning jar with a medley of nasturtiums, from pale yellow to deep scarlet and poured in white wine vinegar, a chopped shallot and a sprinkling of peppercorns. The jar sits on a kitchen windowsill, where the sun’s rays are turning it into a tasty, spicy vinegar I’ll open in midwinter when I’m longing for a flower or two to eat without the worry about critters still buzzing around inside. These are delicious alone as an appetizer, folded into pasta dishes or placed atop a pizza. Italians like to coat the blossoms, stuffed or not, with a simple batter and fry them in olive oil, then salt them, squeeze on a bit of lemon juice and serve. Squash blossoms: gather as many you like from whatever sort of squash you have. I primarily pick male flowers but do take female flowers to keep the zucchini in check. I usually count on two per person. Blossoms are at their best on a dry day just after the sun has had a chance to dry them off, but they are fragile, so be careful with them. If you pick them later in the day, they might well be closed (and hosting bee parties), so be sure to check them for insects. I store them in the fridge, lightly covered with a paper towel. Olive oil for the sauté pan. 2-3 teaspoons fresh ricotta (if you can get it super fresh and cloud-like—I am learning how to make my own. In the meantime I buy it by the scoop at Costello’s in Middlebury.) or soft goat cheese per blossom. I like to make basil and mint the assertive flavors with a hint of lemon thyme and parsley to back them up, but you can use any combination or single herbs. 1. Gently clean the blossoms of dirt and insects and set aside. I do not trim stems or remove stamens though some people think they are a bit bitter and do take the time to pluck them. 2. With a fork, whip the ricotta (and optional yolk) with the herbs, lemon zest, optional cheese and salt to taste. A lovely option is to add 2 tablespoons of lavender honey to the full mixture. 3. Carefully open the blossoms and slip stuffing in, teaspoon by teaspoon (most will take around 2 teaspoons). Some cooks like to use a pastry bag and pipe it in. I find a small, long-handled demitasse spoon works well. Gently twist the end of the blossom shut. Don’t worry if a bit of stuffing escapes if the flower splits a little—it will flavor the sauté pan. 4. Heat a couple of tablespoons of olive oil in a sauté pan over medium high heat and with a spatula, place the blossoms in side by side and brown them lightly on each side (a couple of minutes per side). Remove from pan, squeeze a bit of lemon and a tiny bit of sea salt over them and serve right away. When I am using them on pizza, I skip this step and place the uncooked blossoms on the pizza before it cooks. With pasta dishes, I will cook them before folding then ever-so-carefully into the rest of the topping ingredients. Easy to make and delicious served on berries, drizzled on lemony pound cake, or added to the roasting pan when cooking chicken or potatoes. Makes approximately 1 cup. Stores for at least a month in the refrigerator. Mix the water, sugar and honey in a saucepan and bring to a boil, stirring until the sugar dissolves. Turn the heat down and simmer the syrup until you have a consistency you like—for drizzling, you might like it to be quite thick, so reduce it to about half. I like to use the syrup as a hint, a background texture, so I do not reduce it. Take the pan off the heat and stir in the rosemary and lavender. Let it steep until cool (or longer to intensify the flavors). 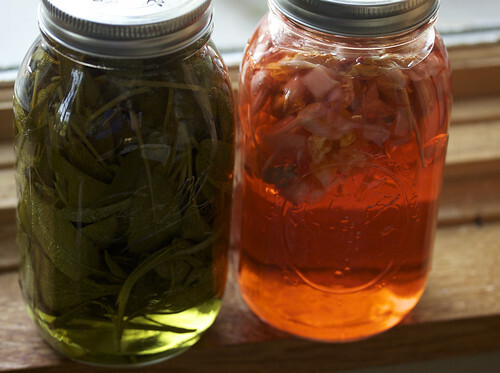 Strain into a sterilized bottle or jar and keep in the refrigerator.